Mariposa and 1605 combined forces to make no-knead bread, because Nagi has a nice Dutch oven that is perfect for that. 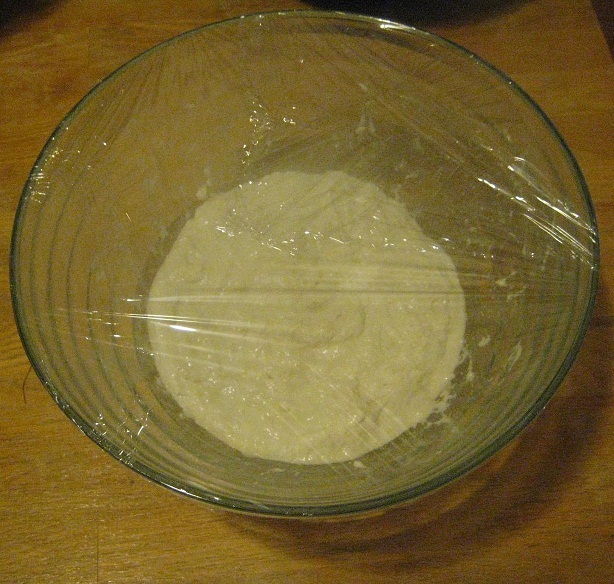 Using a very simple recipe from Sullivan Street Bakery, via the New York Times, we first made the dough, which requires about 12-18 hours to rise before further handling. Because we used active dry yeast, first we had to proof the yeast (i.e., hydrate and activate it) for 10-15 minutes. Following the instructions on the yeast package, that involved adding the 1/4 teaspoon of active dry yeast to the 1 5/8 cups of water that the recipe called for (after the water was heated to about 110-115 degrees Fahrenheit; any hotter would kill the yeast), plus about 1/8 teaspoon of sugar. I think it worked, because smelling the yeast + water concoction reminded me of being at a brewery or a bakery. This entry was posted in Recipes, Side Dish and tagged Baking, Bread. Bookmark the permalink.